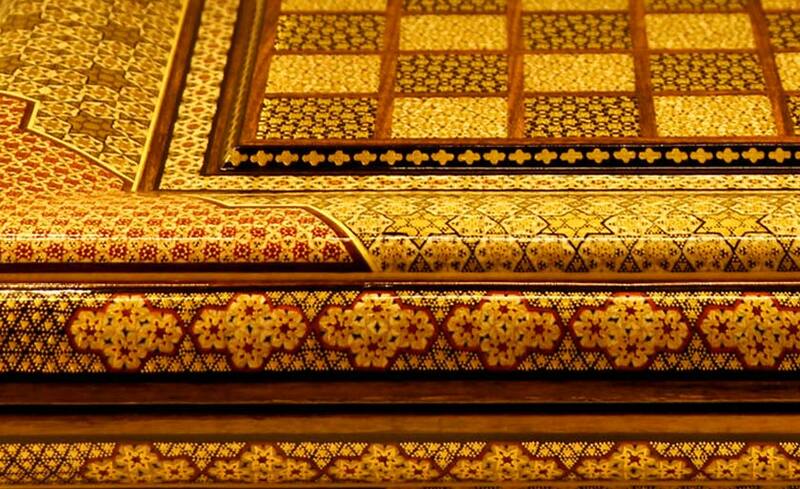 Inlaid is a cover obtained from getting a thin layer of tiny and equilateral pieces of colored wood with a thickness of 1.5 mm together with triangular pieces of brass and bone. 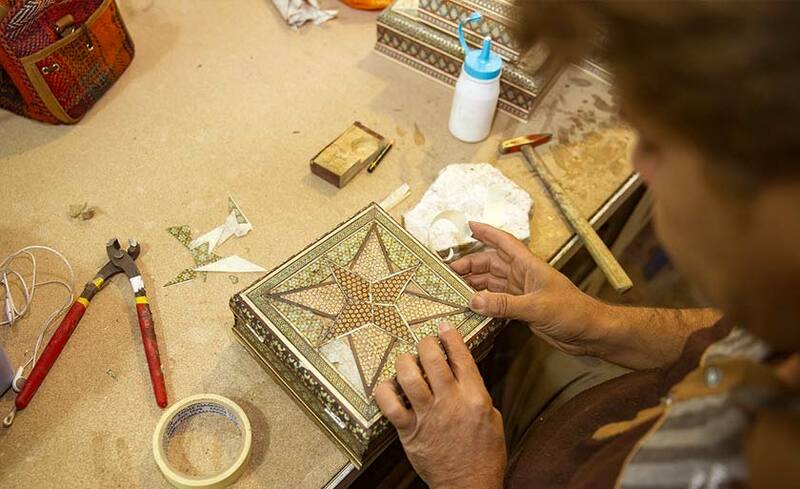 Inlaid working is one of the top arts in Esfahan and there is no evidence who has first created this artifact but its principles are based on mosaic work which has a long history not only in Iran but also all over the world. According to Professor Pope this art is the art of mosaic work, but with colored wood and bone which is also called Khatamband, with the difference that in inlaid working tiny pieces of wood, bone and metal are prepared during a long process and are put side by side very regularly and delicately and in the form of geometrical shapes and after having been cut in layers are stuck on the wooden background by wood paste. The ancient inlaid workings like Quran bookracks or works of arts remained in palaces indicate the antiquity of this art in the city of Esfahan and particularly in the reign of Safavid. 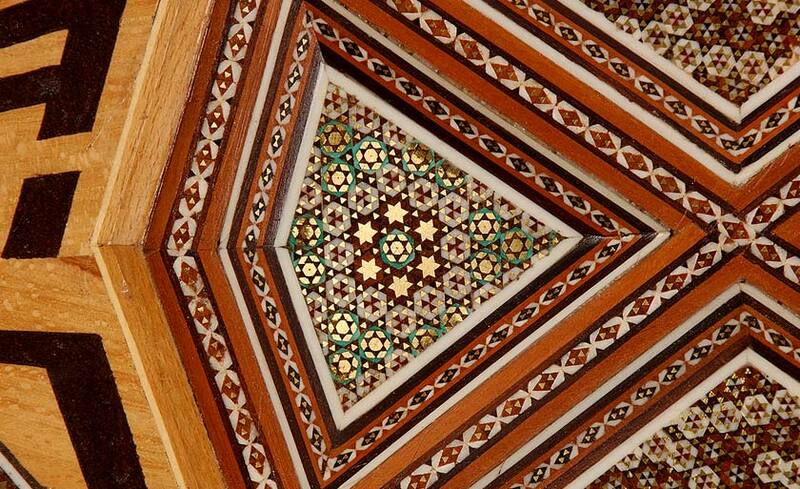 In Esfahan inlaid maker (Khatamkar) first of all cuts the colored woods such as jujube, orange, betel nut, ebony, etc. in the form of a tape with a length of 60 cm and leaves them to get dried. For high quality works, the bones are also used in a way that first, tapes of camel bone are put in limewater for about 3 months so that their color becomes fully white. In the first stage of cutting, the wood and bone tapes are cut and filed in such a way that a clean and triangular cross section is obtained which is traditionally called hexagon star (Shesh). 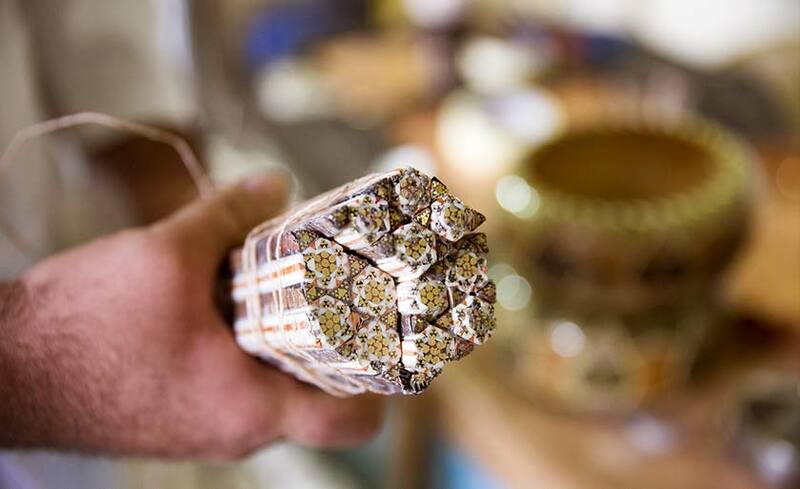 These tapes beside the brass tape which has become completely similar to wood and bone pieces through wiredrawing are put side by side in the form of a colorful and regular layout by a layer of glue. The prepared hexagon stars are fastened with a thread so that while drying, they may be stuck together very tightly. This action continues until a complete flower with a height of 60 cm is obtained. 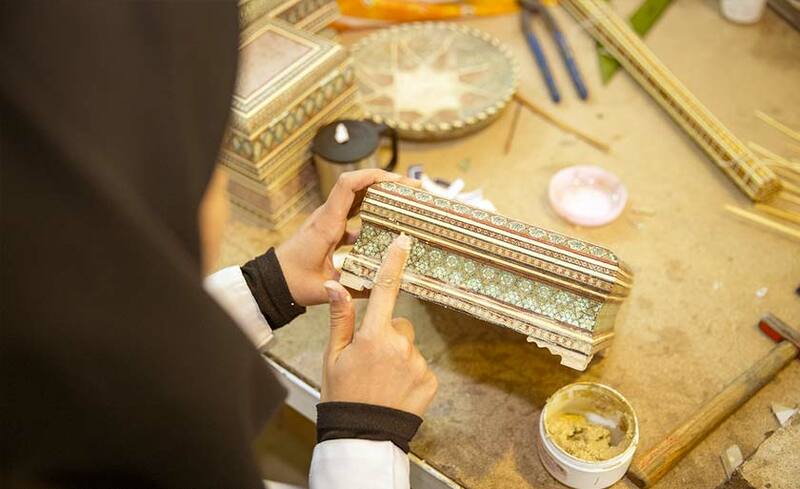 Having prepared several flowers, they are put side by side between two boards and the spaces between them are filled with glue or wood paste, then they are made as a monolithic piece under a press. 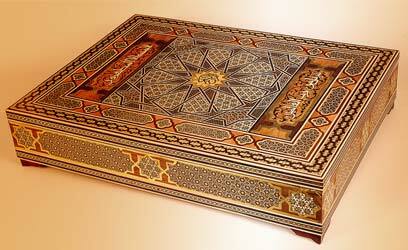 Now it is called rod of inlaid work (Qameh). Then, the craftsman cuts layers with a thickness of 1.5mm from the surface of Qameh by coping saw which is called plate (Lengeh). 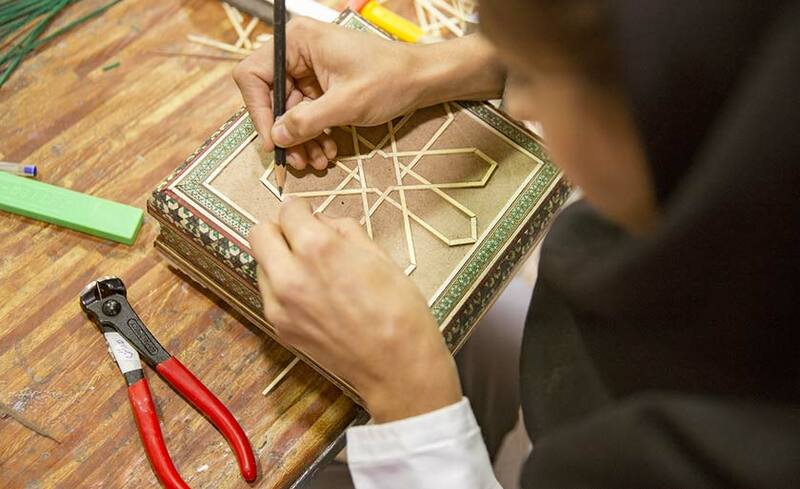 Having prepared the understructure via carpentry, the inlaid works are stuck on the background of the work through special glues and by heating based on their design, color, shape and dimensions. After priming, rubbing and restoring the surface of the work, the inlaid work is prepared and finally it is covered by a layer of lacquer. The finer and stronger the prepared piece of inlaid working, the more its value, especially if it is made of the high quality material. In some cases, gold and silver are used instead of brass. The inlaid objects are sensitive to heat and humidity and in the case they are not of high quality, when adjacent to such elements they will be peeled off the surface of the object.